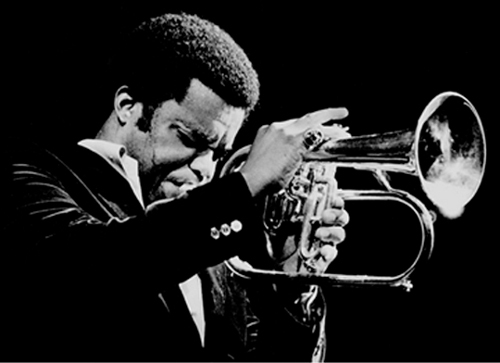 Freddie Hubbard is one of my favourite jazzists. Surely one of the greatest jazz trumpeters of all times. He recorded albums as a leader and sideman with many of the greatest: John Coltrane, Herbie Hancock, Art Blakey, Joe Henderson, Wayne Shorter, Ornette Coleman, Woody Shaw, and many others. He has a furious and groovy sound. A style that can actually be seen in the way he plays (see the photo above). He became more popular during the 1970s with a series of albums recorded for CTI Records including a sort of trilogy of funk-influenced hard bop albums: Red Clay, First Flight, and Straight Life. The last one is quite special to me. I bought a Straight Life CD _back in 2007 when I was still living in Finland. As I mentioned in a previous post, I found a very nice record shop in Helsinki — close to Kamppi — and I used to go there every other weekend to pick new albums more or less randomly. _Straight Life was the first-ever Hubbard album I tried. I became a fan almost instantly! The personel is full of stars: Joe Henderson (Sax), Herbie Hancock (Electric Piano), Ron Carter (Bass), Jack DeJohnette (Drums), George Benson (Guitar), Richard Landrum (Percussion), and Weldon Irvine (Tabla/Tambourine). The album has three tracks: Straight Life, Mr. Clean, and “Here’s That Rainy Day”. The order of the tracks is an exact match on my personal rank. Straight Life is an amazing 17 minute (!) performance. Mr. Clean is a nice medium tempo funky tune. “Here’s That Rainy Day” is a ballad — but Hubbard is not good with ballads in my opinion. I love this album mostly because of the track that names the album. Hubbard starts Straight Life with some fast arpeggios alternated with DeJohnette’s drumming. It’s like a musical greeting. Makes you curious about what’s to come. Then Hubbard starts the theme and the band follows. The rhythm is hard to explain. It’s a bit amorphous and very rich in complexity. It’s some sort of afro-latin thing. It’s interesting how the soloists make such a complex rhythm sound so natural. The solos by Henderson and Hubbard are my favourite. This was the first time I heard Henderson playing. The great moment of his solo is when he plays the theme in a different scale on top of an unexpected harmony played by Hancock. Hubbard starts his solo with a very soft sound and then moves on to a faster and high-pitched solo. Straight Life (the album) introduced me to Freddie Hubbard and Joe Henderson at their best and I’ve been enjoying their albums a lot since then. This album is definitely in my top 10 list. You can read reviews of this album at AllAboutJazz, BBC, and Jazzbo Notes. See also this video of Hubbard performing Straight Life. Enjoy!